A 14-year-old girl hires a U.S. Marshal to hunt down the man who murdered her father. Is "True Grit" the movie that started the marble/mush-mouth accent Jeff Bridges has used in tons of films since 2010? We reckon so! This movie is written and directed by Joel and Ethan Coen, so you know it has got to be good. They have directed some of our favorite films, including "O Brother, Where Art Thou?," "No Country for Old Men," and "The Big Lebowski." It is a remake of the John Wayne-led western of the same name from 1969. The aforementioned Jeff Bridges takes on the role of the one-eyed alcoholic lawman named Reuben 'Rooster' Cogburn. Joining him is Hailee Steinfeld in her feature film debut as Mattie Ross, a 14-year-old girl who has a smart business sense and an even smarter mouth. Mattie is determined to hunt down the man who killed her father come hell or high water. She hires Rooster for the job because it is said he is the meanest U.S. Marshal around and is also the least likely to bring in a suspect alive. Mattie just has one catch: she gets to come along for the manhunt and nothing will dissuade her from doing so. Also in the film are Matt Damon, Josh Brolin, and Barry Pepper. 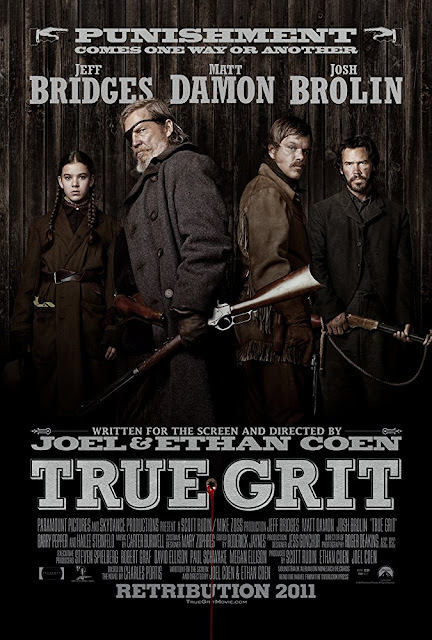 "True Grit" is another film in a long line of worthy examples that proves remakes aren't inherently awful. It probably helps to have a couple of writer/directors as talented as The Coen Brothers to do the remake justice, but that's beside the point. This proves to be an impressive western full of wonderful performances and a surprising amount of humor. Both Hailee Steinfeld and Jeff Bridges are fantastic and build an interesting relationship with one another as Mattie strives to kill the man who betrayed and murdered her father. They are the perfect opposites: Rooster is gruff and mean, and she is stubborn but sweet and always speaks frankly. Both Steinfeld and Bridges received very deserved Oscar nominations for their performances. Matt Damon isn't terrible either and gives one of his better performances as Texas Ranger LaBouef. Apart from the acting, the direction is excellent and the cinematography is absolutely stunning. We were not at all surprised when we noticed Roger Deakins' name pop up as cinematographer as the credits rolled. Deakins does a brilliant job capturing the dusty, dreary southern landscape. The story here is a simple tale of justice and revenge, but it's the characters, the performances, and the dialogue that helps it be a supremely engaging, highly successful western film. Many westerns movies just don't have the - wait for it - grit, to be successful. The "True Grit" remake has almost everything fans of the genre could want and is compelling enough to please those who are not huge fans of westerns. We will admit, we only seem to like the cream of the crop of the genre ("High Noon," "Unforgiven," The Good, the Bad, and the Ugly," "Quigley Down Under"), but Joel and Ethan Coen have done an astounding job making this old story their own. They get the audience invested regardless of the fact that it is about cowboys and outlaws. It has been a while since we have seen the original, but from what we remember, we may actually enjoy this version more.